As a freelance photographer, his works have been published for JiwaFoto agency and a lot of print magazine such as MTV Trax Magazine Indonesia, FHM Indonesia, Rolling Stone Indonesia, FAIRPLAY (England) and COURRIER Japon (Japan). One of his best works published in ENTER edition 7 (June 2007), on line magazine from World Press Photo Foundation. SYAMSUL HADI, born in Jakarta, Indonesia 1981. He graduated from the Jakarta Art Institute with a degree in film, majoring in screenplay writing. 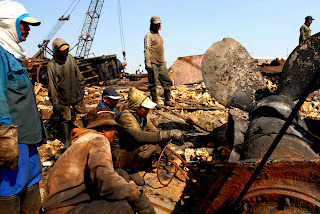 AGUSTUS, 2008 - "Ship Breaking", Cilincing - North Jakarta.